Discussion in 'Desteria Announcements' started by iLemon, Apr 7, 2019. A new feature arriving at Desteria with the simple purpose of limiting the speed of cannons. In short, a wall in a base's protection buffer becomes fortified for the cannoning speed limit duration. This means the wall is effectively given infinite durability until the cooldown is over. Blue shows the water between walls. 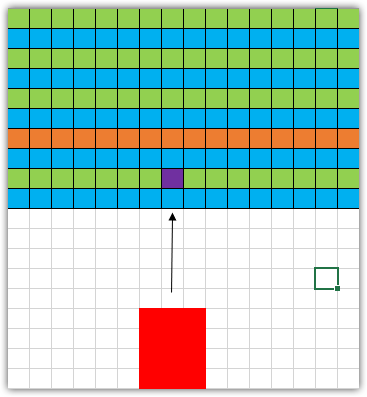 The attacking faction (red) destroys part of a wall (green) at the area shown in purple. As soon as any single block of that wall is destroyed, the entire wall behind (orange) becomes Fortified and thus cannot be exploded until the cooldown is over. This feature was designed so that we can enforce a server-side restriction on the rate of firing a cannon, without any possible bypasses. Any future tweaks of the speed limits will be announced in future season changelogs. I thought 5secs won? why didnt you just make it 4 lol people want 2 and some people want 5?? Why’d you even have the poll if you were gonna keep it at 3 seconds anyway when the majority of the community wanted 5?